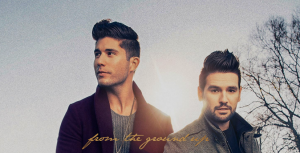 Dan + Shay are off to a great start in their career. They had three hit singles from their first album and the last single went all the way to number one last year. The goal now is to build on that success with another album. It’s always a challenge to take momentum from one album to another. Here is the first single from their next record. This is a really good song. It’s a bit of a story song and a little about a guy reflecting on the relationship he’s building with his girl. It sounds like they’ve been together maybe a little while and they’re starting to think about committing for the rest of their lives. It’s kind of cool. People can easily look at younger generations as fooling around and things like that especially in the world we live in today. But even young folks are looking for that everlasting love that they see older generations having. That’s what it says in the beginning of the song. The guy’s grandparents were the inspiration for him and now he wants to build that with the one he loves the most. This song seems like something that will be a hit. It’s something you can sing along with. You can slow dance around to it with the person you care for. Dan + Shay have a different sound. It’s not Rascal Flatts, but they remind me of that style of modern country music and a little of that sound. And that would be a great act to follow because they became one of the biggest acts in country music history.